Rural Revolution: Poor little ducklings! 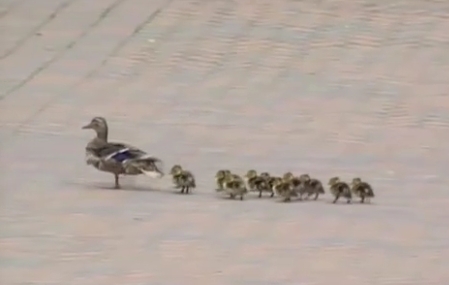 Here's a short video clip of some ducklings obediently following their mama in New Zealand - until a strong gust of wind scatters them. Poor little guys! Oh, that was scary. Glad they regrouped and carried on. There's a lesson for us humans. I'm sure it was very scary for that family of ducks being blown of course by something out of their control. But they persevered and made it through their tough times, as we can. PS: the beginning of the clip shows "Filmed by Matthew Stevens at Woodbine Racecourse in Canada"
I tried to feel the pain of those poor little ducklings. As soon as I felt sure they were ok, I laughed until I cried. Thanks for sharing that!